“All Aboard!”, calls the conductor, and your family's magical journey to the beautiful North Pole begins! Through the dark night, the North Pole Express makes its way by starlight to the top of the world. On the way, you'll listen to a whimsical Christmas story, sing your favorite holiday carols, and watch out the windows for the bright lights of the North Pole to appear. Upon arrival at the brilliantly decorated home of the Toymaker himself, the elves, Santa, and Mrs. Claus will all board the train to visit your family and to take photos with every child. Be sure to whisper your wish for what you're hoping to find under your tree on Christmas morning! After your special visit with the Christmas couple, you'll enjoy chocolate drinks and a yummy treat - delivered by the North Pole Express chefs. You can dance with the elves, receive a lovely Christmas keepsake, and relax for the music-filled ride back to the Depot. Your North Pole Express adventure will make lasting Christmas memories for you and your family for years to come -- And for even more festive fun, be sure to wear your pajamas for the ride! Enjoy a front row seat in the C&NW-A to watch the train's LIVE entertainers tell a whimsical Christmas tale and perform Christmas songs for everyone on the train! For a live view from further back, relax on the C&NW-B. - A complimentary glowstick for each child. The Frisco 1062 is the most historic car to travel on the North Pole Express. Built in 1910, the car's beautifully decorated interior provides a classical Christmas atmosphere from yesteryear. Known as the "party car," this large, brightly decorated car offers extra leg room between facing seats -- perfect for the little ones to dance in with elves! This unique car offers not only comfortable Lower Level seating, but also a smaller upper level covered by a glass dome! When you purchase the Upper Level seats (ONLY), you'll travel by starlight and get the first view of the North Pole Lights from above. The North Pole Express train ride lasts approximately 1½ hours including the train ride through the forest and time spent relaxing onboard the train while stationed at the North Pole. Group tickets (20+) go on sale 9AM CST July 8, 2019. Individual tickets go on sale 9AM CST July 22, 2019. Tickets sell quickly! Immediate purchase is essential! Tickets will not be available at the museum's office. You will have a ticket confirmation emailed to you after purchase if email address was provided during purchase. Please print the ticket confirmation out and bring to the Calera Depot ticket window on the night of your ride so as to pick up your tickets. Ticket confirmations cannot be used in place of tickets to board the train. Children under 24 months of age ride free of charge. However, each infant is required to sit in an adult's lap at all times while on the train. When ordering your tickets, select "Coach Infant" (if available) or simply request a complimentary infant ticket at the Ticket Depot to receive the appropriate ticket. If you did not order an infant ticket with your initial order, notify the ticket agent upon arrival. 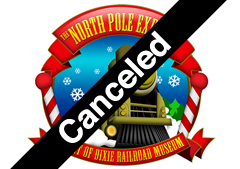 Upon purchasing a ticket to participate in the events sponsored or hosted by The Heart of Dixie Railroad Museum, you acknowledge and agree that you and/or your child (and/or children) in your care may be photographed and/or videotaped. You agree that any such image may be used to publicly promote the museum and its events via print publications, online publications, presentations, websites and social media. You also understand that no compensation nor fee will be provided to you for the use of such photographs/videos. Snacks and drinks are available for purchase at the Gift Shop and may be provided during certain special events. However, The Heart of Dixie Railroad Museum's policy is that other than bottled water and infant care items, no outside food or beverages may be brought onboard the train. Please finish or dispose of refreshments before attempting to board the train. For the safety of our visitors, The Heart of Dixie Railroad Museum will temporarily close when lightning is present and will remain closed for 30 minutes past the last lightning occurrence. The HODRRM may close for the day if inclement weather conditions persist. If your scheduled train ride is cancelled and will not be rescheduled that same day, HODRRM may provide, upon request, a full refund or exchange of your ticket. - Get in position to board the train. Need more information? Please read over the North Pole Express Frequently Asked Questions! Tickets and Event Information are available through the ticket call center at 205-757-8383 . Follow us on Facebook, Twitter and monitor our website for information about North Pole Express 2018!